A fantastic list of things to do in April that will help sort both your home and life out at this time of year. Lots of inspiration and ideas to add to your Planner or Diary in April. 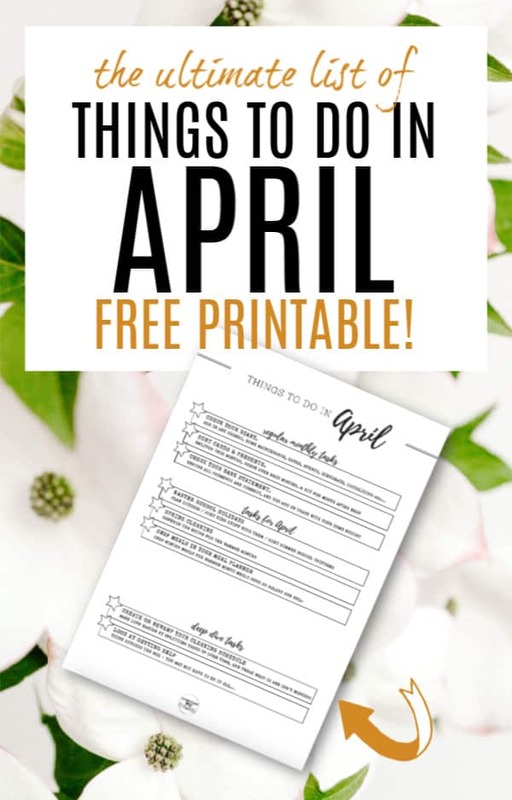 It includes a fantastic free printable TO DO list with all the tasks written out for you, some April facts, and a quote. You’ll be more organised than ever! APRIL – THE TIME OF YEAR WHEN…. It’s the month of Easter, Spring really getting going, lighter nights have arrived – it really is one of my favourite months! April is the start of the second quarter of the year, and really feels like a great time to think about refreshing a few things in your home, as everything seems to be more visible after the winter (cobwebs that the winter was nicely hiding seem to spring out of nowhere! ), and we have a bit more energy from the lighter days to get more done. If we can get our home sorted now, it means that it will be far more under control by the time the summer months hit and you can sit back and relax a bit during the hotter (hopefully!) months…. Its the Easter holidays for most schools in April so now is the time to spend time with the children. But it’s also a great idea to make the most of the time at home by doing some organising – why not sort their clothes and toys with them and replace anything that needs it? This shows them there are certain “upkeep” jobs that need to be done as well as having fun. Also – make sure you have got the summer school uniforms ready – its perfect time to get the kids measured up and ready once the weather gets warmer. It’s my month to spring clean the house – getting back on top of things again. This isn’t just cleaning to me, but also some level of decluttering and sorting – and you’ll be pleased to know that I’m definitely not advocating getting it all done this month – but at least getting some done, and putting a plan in place for the rest (that’s where the deep dive tasks I’ll talk about later come into play…). The house is a big project – and it can be daunting to try and tackle everything in one go – but there are things that naturally would be done as part of a big “spring clean” and that can fall through the gaps as they don’t come up on a weekly cleaning routine. I think of Spring Cleaning as a chance to focus on those areas that you don’t really get round to in your usual cleaning routines, and get them back to looking great again. Spring cleans came about originally due to the open fireplaces that were heating every home throughout the winters. They left dust and soot everywhere – so that when the spring came (and the light!) the whole house felt dirty and in need of a thorough clean. But we don’t all have these issues now (although as I said before, the winter grey can stop us seeing some of the dirt *cough* cobwebs * cough* that accumulates! ), so the way we tackle things can be different too. However you tackle Spring Cleaning – make April the month where you do a little more than your regular cleaning, and you’ll love the difference it makes to how you feel and how your home looks. Now that it’s Spring and Winter has well and truly gone, it’s a great time to look at swapping out the more wintery food from your meal plan and add in lighter and fresher foods. Take away the soups, stews and casseroles and add in more salads, the odd BBQ etc… – this will rejuvenate meal time again. These are things that follow my organising roadmap for the year. April is the month for tackling your cleaning schedule, and possible getting help going forward. If you don’t have a cleaning schedule at all as yet, then create one this month. You can read my detailed post about how to do that HERE. If you HAVE got a cleaning schedule already, then now is the time to sit down with it and go through it to check what is and isn’t working, and tweak if needed. I recently got a cleaner once a week for my own home, and it’s been a game changer for me. Work has got very busy, and there are just not enough hours in the day to do it all (try as I might!) – something had to give. I’m not quite there in terms of delegating working tasks to someone else, so I decided that delegating the regular weekly clean would be a great option. It leaves me with an extra couple of hours a week to get my work done, and gives me peace of mind that everything’s still clean. I can then do the extra tasks, deep cleans etc… – but the day to day is covered. Bliss! The amazing thing is how long it took me to hire someone though. I felt guilt for not being able to do it all myself, something I know that we as women are always feeling. But now I feel no guilt. I know that I *can* clean if I have to, I actually enjoy it – but my time is better spent right now on work stuff. Because I work, I can also pay for the cleaner myself – so I am taking control of what I want to spend my time on – and sorting it out myself. So – if you are hesitant to get help, then I urge you to consider it. It can be a real pleasure, a treat, and may just keep you sane in the process! Swap tasks with a friend. If you love ironing but hate cleaning, you may find that you prefer to do that for your friend, and she will clean for you. EASTER (Although changes every year – so could be in APRIL also. APRIL FOOLS DAY – 1st – just be on the lookout for any pranks coming your way! There are lots of gift guides and gift giving inspiration for different people on the site already, so take a look HERE, but if you want something specific to the month then why not use the March Facts in the section above, and take inspiration from them? #1 – APRIL BIRTHSTONE BRACELET** – A gorgeous little keepsake that a special woman in your life would love to wear. #2 – BIRTH FLOWER SEED BOX – LOVE LOVE LOVE this idea! I would especially use in the Spring as that’s all about flowers and new growth etc…. There you have it – all the things to do in April to get more organised! Getting on top of things in the house after the Winter months, setting up/tweaking your cleaning schedule, and getting help, are the important homemaking tasks for this month. Alongside that, reinventing your meal plan to be more in line with spring and summer food can be a lovely way to introduce the family to new meals, and make cooking interesting! Oh, and of course, enjoy the Easter break whatever you are doing – you deserve it! I love how organised your lists are! 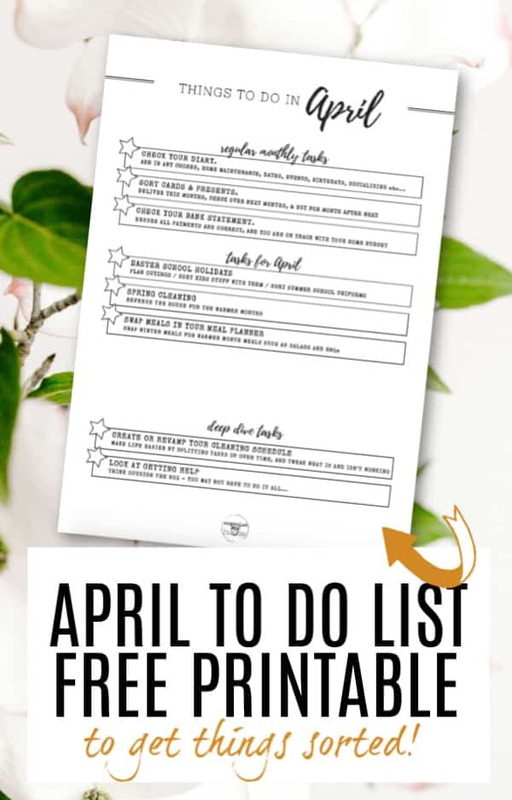 They are always very helpful, because all the details are well stated, and the printables have adorable designs, which just push you to fulfill all the tasks faster, just so you can cross them out. Thanks Jane – glad you like them!